Americans call it vest; and in Britain it is called as waistcoat. Waistcoats can give you great look in Business as well as in Casual. One has only to know how to wear them! They need to look like they’re tailor made, just like any well-fitting blazer. The waist of the vest looks better when it fits perfectly. Seriously, there’s kind of an art to choosing the right Waistcoat. It must not be too long as to drown out the figure. It should not be too loose as to hide the waist and the arm holes can’t be too big. The neckline shouldn’t be too high up either. But when you’ve found the correct fitting waistcoat, its very figure flattering. It’s always worth the hunt for the perfect fit one. When worn with a tank top, only a little bit of the tank top peaking up from the chest and the rest of it peaking out from the bottom. It does not look good if the tank top peaking out from the sides too much or at all under the armpit. To avoid this happening, make sure the arm holes are not too low. Denim vests you can try on a single piece dress even on a regular one that you use. This gives a flattering look when its worn with a solid colored blouse or shirt no matter whether it’s a full sleeve or half. Even you can keep your vest open showing your printed T-Shirt. This is basically a mix design of a vest and suspenders. These kinds of waistcoats look great. 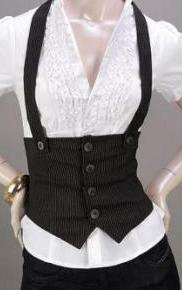 It’s a kind of waistcoat that sits below the chest instead of on the chest and the top looks like suspenders.